(Phys.org)—A pair of researchers, one with the Naturalis Biodiversity Center in the Netherlands, the other with the University of Bristol in the U.K. has found what appears to be the earliest known example of a creature sporting teeth. 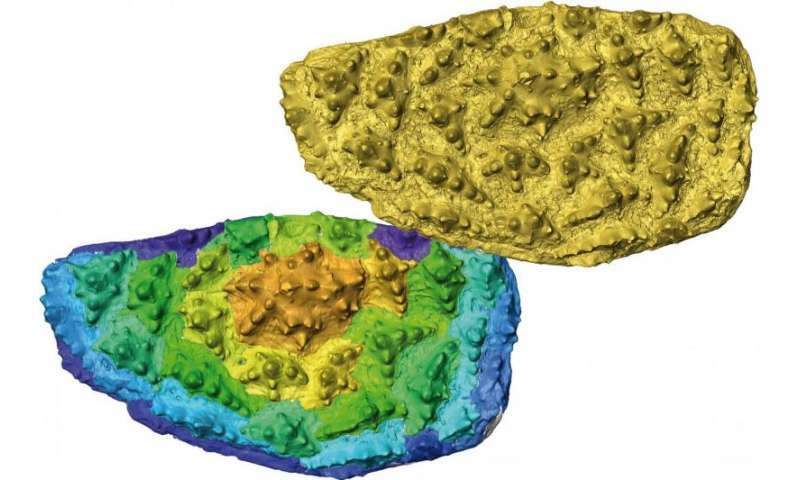 In their paper published in The Royal Society's Biology Letters, Martin Rücklin, and Philip Donoghue describe their work in examining the fossilized tooth plate of an ancient fish. After much research, scientists have come to believe that modern teeth, regardless of species, originated from scales on fish—this new research appears to confirm that theory and also offers some new insights into how it was that teeth came to exist. The study came about as a tooth plate fossil was found in a box in a museum—it had apparently been stored for approximately forty years. 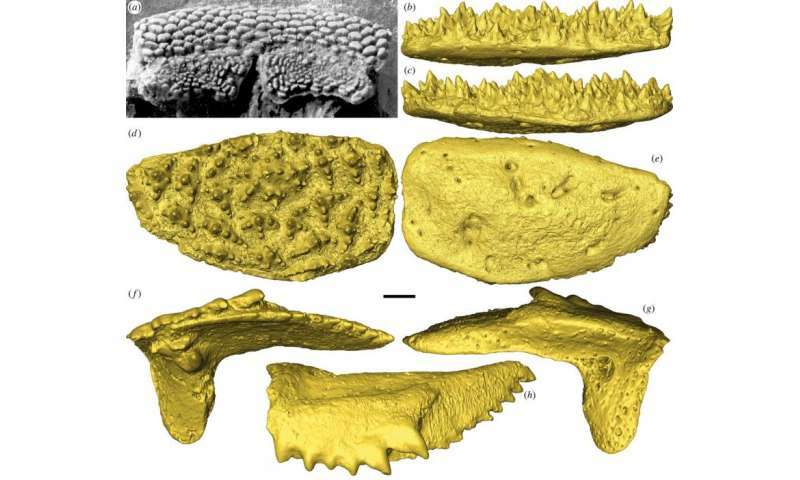 The tooth plate came from an extinct class of fish known as Romundina stellina, and offered the researchers an opportunity to study what they believe to be the earliest known example of teeth in an organism. Upon examination, the researchers determined the fossil was an upper plate, and that it had multiple very small teeth, which likely helped in crushing food—they suggest the fish likely swam near the surface, catching and eating prey as it went. The fossil was dated to approximately 410 million years ago—the researchers note that older examples of the fish have been found, but they did not have the teeth, thus this new finding helps establish how they came about. 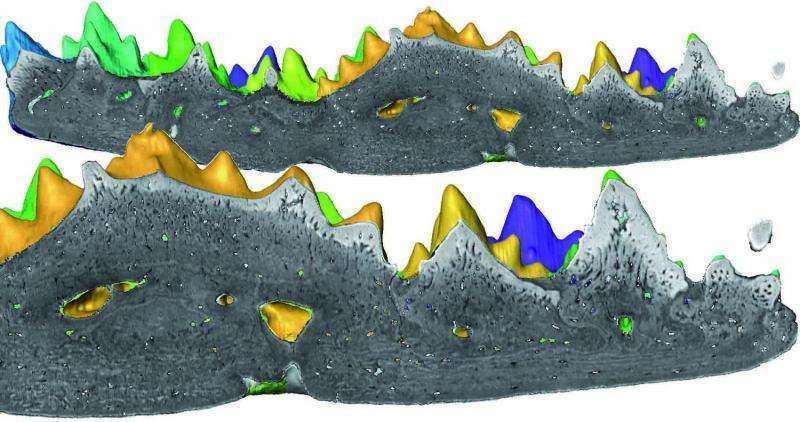 To learn more about the teeth, the researchers 3D x-rayed the plate thousands of times from every conceivable angle and then fed the results to a computer with special software that allowed for recreating the plate in a way that showed how it might have evolved over time. Also, analysis showed that the teeth were made of the same material as fish scales and modern human teeth and that they were present in the absence of a jawbone, which appears to confirm theories that the two evolved separately. They believe that the evolutionary process that led to the development of teeth is likely the same general process that led to other organs, thus learning how they came about, might offer clues as to how all of the other organs found in various creatures came about as well. Theories on the origin of vertebrate teeth have long focused on chondrichthyans as reflecting a primitive condition—but this is better informed by the extinct placoderms, which constitute a sister clade or grade to the living gnathostomes. Here, we show that 'supragnathal' toothplates from the acanthothoracid placoderm Romundina stellina comprise multi-cuspid teeth, each composed of an enameloid cap and core of dentine. These were added sequentially, approximately circumferentially, about a pioneer tooth. Teeth are bound to a bony plate that grew with the addition of marginal teeth. Homologous toothplates in arthrodire placoderms exhibit a more ordered arrangement of teeth that lack enameloid, but their organization into a gnathal, bound by layers of cellular bone associated with the addition of each successional tooth, is the same. The presence of enameloid in the teeth of Romundina suggests that it has been lost in other placoderms. Its covariation in the teeth and dermal skeleton of placoderms suggests a lack of independence early in the evolution of jawed vertebrates. It also appears that the dentition—manifest as discrete gnathal ossifications—was developmentally discrete from the jaws during this formative episode of vertebrate evolution.